I am happy to meet you and I thank you for your warm welcome. 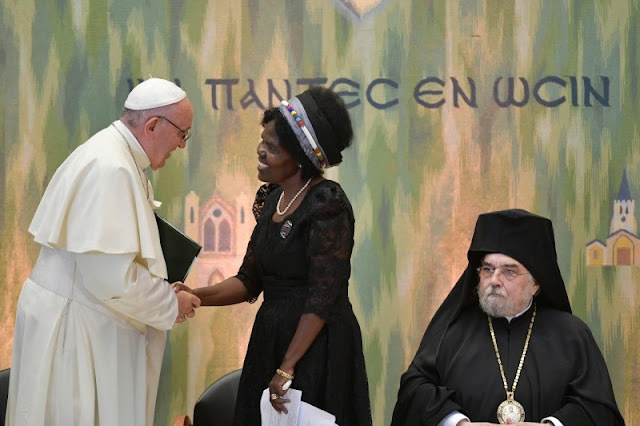 In particular, I express my gratitude to the General Secretary, the Reverend Dr. Olav Fykse Tveit, and the Moderator, Dr. Agnes Abuom, for their kind words and for their invitation on this seventieth anniversary of the founding of the World Council of Churches. In the Bible, seventy years represents a significant span of time, a sign of God’s blessing. But seventy is also a number that reminds us of two important passages in the Gospel. In the first, the Lord commands us to forgive one another not only seven times, but “seventy times seven” (Mt 18:22). That number, of course, does not serve as a limit, but opens up a vast horizon; it does not quantify justice, but serves as the measure of a charity capable of infinite forgiveness. After centuries of conflict, that charity now allows us to come together as brothers and sisters, at peace and full of gratitude to God our Father. If we are here today, it is also thanks to all those who went before us, choosing the path of forgiveness and sparing no effort to respond to the Lord’s will “that all may be one” (cf. Jn 17:21). Out of heartfelt love for Jesus, they did not allow themselves to be mired in disagreements, but instead looked courageously to the future, believing in unity and breaking down barriers of suspicion and of fear. As an ancient Father in the faith rightly observed: “When love has entirely cast out fear, and fear has been transformed into love, then the unity brought us by our Saviour will be fully realized” (SAINT GREGORY OF NYSSA, Homily XV on the Song of Songs). We are heirs to the faith, charity and hope of all those who, by the nonviolent power of the Gospel, found the courage to change the course of history, a history that had led us to mutual distrust and estrangement, and thus contributed to the infernal spiral of continual fragmentation. Thanks to the Holy Spirit, who inspires and guides the journey of ecumenism, the direction has changed and a path both old and new has been irrevocably paved: the path of a reconciled communion aimed at the visible manifestation of the fraternity that even now unites believers. The number seventy reminds us of yet another Gospel passage. It recalls those disciples whom Jesus, during his public ministry, sent out on mission (cf. Lk 10:1), and who are commemorated in some Churches of the Christian East. The number of those disciples reflects the number of the world’s peoples found on the first pages of the Bible (cf. Gen 10). What does this suggest to us, if not that mission is directed to all nations and that every disciple, in order to be such, must become an apostle, a missionary. The World Council of Churches was born in service to the ecumenical movement, which itself originated in a powerful summons to mission: for how can Christians proclaim the Gospel if they are divided among themselves? This pressing concern still guides our journey and is grounded in the Lord’s prayer that all may be one, “so that the world may believe” (Jn 17:21). Dear brothers and sisters, allow me to thank you for your commitment to unity, but also to express a concern. It comes from an impression that ecumenism and mission are no longer as closely intertwined as they were at the beginning. Yet the missionary mandate, which is more than diakonia and the promotion of human development, cannot be neglected nor emptied of its content. It determines our very identity. The preaching of the Gospel to the ends of the earth is part of our very being as Christians. The way in which the mission is carried out will, of course, vary in different times and places. In the face of the recurring temptation to tailor it to worldly ways of thinking, we must constantly remind ourselves that Christ’s Church grows by attraction. But what makes for this power of attraction? Certainly not our own ideas, strategies or programmes. Faith in Jesus Christ is not the fruit of consensus, nor can the People of God be reduced to a non-governmental organization. No, the power of attraction consists completely in the sublime gift that so amazed the Apostle Paul: “to know Christ and the power of his resurrection and the sharing of his sufferings” (Phil 3:10). This is our only boast: “the knowledge of the glory of God in the face of Jesus Christ” (2 Cor 4:6), granted us by the Holy Spirit, the Giver of Life. This is the treasure that we, though earthen vessels (cf. v. 7), must offer to our world, so beloved yet so deeply troubled. We would not be faithful to the mission entrusted to us, were we to debase this treasure to a purely immanent humanism, adapted to the fashion of the moment. Nor would we be good guardians if we tried only to preserve it, burying it for fear of the world and its challenges (cf. Mt 25:25). What is really needed is a new evangelical outreach. We are called to be a people that experiences and shares the joy of the Gospel, praises the Lord and serves our brothers and sisters with hearts burning with a desire to open up horizons of goodness and beauty unimaginable to those who have not been blessed truly to know Jesus. I am convinced that an increased missionary impulse will lead us to greater unity. Just as in the early days, preaching marked the springtime of the Church, so evangelization will mark the flowering of a new ecumenical spring. As in those days, let us gather in fellowship around the Master, not without a certain embarrassment about our constant vacillations, and, together with Peter, let us say to him: “Lord, to whom can we go? You have the words of eternal life (Jn 6:68). Dear brothers and sisters, I wanted to take part personally in the celebrations marking this anniversary of the World Council, not least to reaffirm the commitment of the Catholic Church to the cause of ecumenism and to encourage cooperation with the member churches and with our ecumenical partners. In this regard, I would like to reflect briefly on the motto chosen for this day: Walking, Praying and Working Together. Walking. Yes, but where? From all that has been said, I would suggest a two-fold movement: in and out. In, so as to move constantly to the centre, to acknowledge that we are branches grafted onto the one vine who is Jesus (cf. Jn 15:1-8). We will not bear fruit unless we help one another to remain united to him. Out, towards the many existential peripheries of today’s world, in order to join in bringing the healing grace of the Gospel to our suffering brothers and sisters. We might ask ourselves whether we are walking in truth or simply in words, whether we present our brothers and sisters to the Lord out of true concern for them, or if they are removed from our real interests. We might ask ourselves too, whether we keep walking in our own footsteps, or are setting out with conviction to bring the Lord to our world. Praying. In prayer too, like walking, we cannot move forward by ourselves because God’s grace is not so much tailored to fit each individual as spread harmoniously among believers who love one another. Whenever we say “Our Father”, we feel an echo within us of our being sons and daughters, but also of our being brothers and sisters. Prayer is the oxygen of ecumenism. Without prayer, communion becomes stifling and makes no progress, because we prevent the wind of the Spirit from driving us forward. Let us ask ourselves: How much do we pray for one another? The Lord prayed that we would be one: do we imitate him in this regard? Working together. Here I would like to reaffirm that the Catholic Church acknowledges the special importance of the work carried out by the Faith and Order Commission and desires to keep contributing to that work through the participation of highly qualified theologians. The quest of Faith and Order for a common vision of the Church, together with its work of studying moral and ethical issues, touch areas crucial for the future of ecumenism. I would also mention the active presence of the Church in the Commission on World Mission and Evangelism; collaboration with the Office for Interreligious Dialogue and Cooperation, most recently on the important theme of education for peace; and the joint preparation of texts for the Week of Prayer for Christian Unity. These and various other forms of working together are fundamental elements in a sound and time-tested cooperation. I also value the essential role played by the Bossey Ecumenical Institute in the training of future pastoral and academic leaders in many Christian Churches and Confessions worldwide. The Catholic Church has long participated in this educational project through the presence of a Catholic professor on the faculty, and each year I have the joy of greeting the group of students who visit Rome. I would likewise mention, as a good sign of “ecumenical team spirit”, the growing participation in the Day of Prayer for the Care of Creation. I would also note that the work of our Christian communities is rightly defined by the word diakonia. It is our way of following the Master who came “not to be served but to serve” (Mk 10:45). The broad gamut of services provided by the member churches of the World Council finds emblematic expression in the Pilgrimage of Justice and Peace. The credibility of the Gospel is put to the test by the way Christians respond to the cry of all those, in every part of the world, who suffer unjustly from the baleful spread of an exclusion that, by generating poverty, foments conflicts. The more vulnerable are increasingly marginalized, lacking their daily bread, employment and a future, while the rich are fewer and ever more wealthy. Let us be challenged to compassion by the cry of those who suffer: “the programme of the Christian is a heart that sees” (BENEDICT XVI, Deus Caritas Est, 31). Let us see what we can do concretely, rather than grow discouraged about what we cannot. Let us also look to our many brothers and sisters in various parts of the world, particularly in the Middle East, who suffer because they are Christians. Let us draw close to them. May we never forget that our ecumenical journey is preceded and accompanied by an ecumenism already realized, the ecumenism of blood, which urges us to go forward. Let us encourage one another to overcome the temptation to absolutize certain cultural paradigms and get caught up in partisan interests. Let us help men and women of good will to grow in concern for events and situations that affect a great part of humanity but seldom make it to the front page. We cannot look the other way. It is problematic when Christians appear indifferent towards those in need. Even more troubling is the conviction on the part of some, who consider their own blessings clear signs of God’s predilection rather than a summons to responsible service of the human family and the protection of creation. The Lord, the Good Samaritan of mankind (cf. Lk 10:29-37), will examine us on our love for our neighbour, for each of our neighbours (cf. Mt 25:31-46). So let us ask ourselves: What can we do together? If a particular form of service is possible, why not plan and carry it out together, and thus start to experience a more intense fraternity in the exercise of concrete charity? Dear brothers and sisters, I renew to you my cordial thanks. Let us help one another to walk, pray and work together, so that, with God’s help, unity may grow and the world may believe. Thank you.